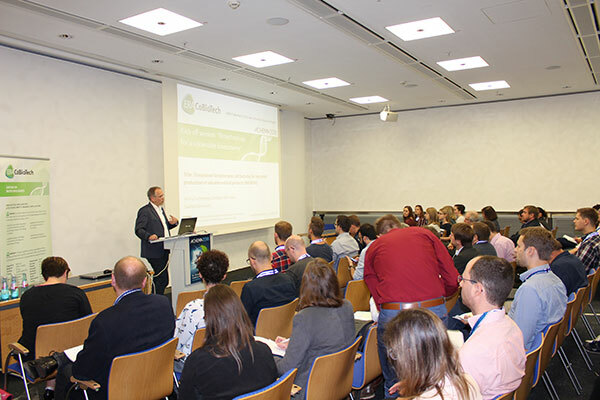 Coordinators and representatives of 22 research projects funded through the 1st ERA CoBioTech call, cofunded by the European Union, presented their startingresearch projects on June 13-14, 2018 in a kick-off event organised by the Agency for Renewable Resources (FNR) at the ACHEMA 2018 congress in Frankfurt am Main, Germany. 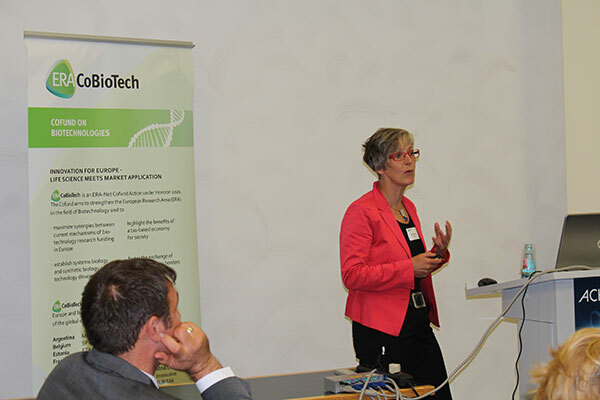 The four sessions of the event, entitled “Biotechnology for a sustainable bioeconomy” attracted more than 100 visitors. 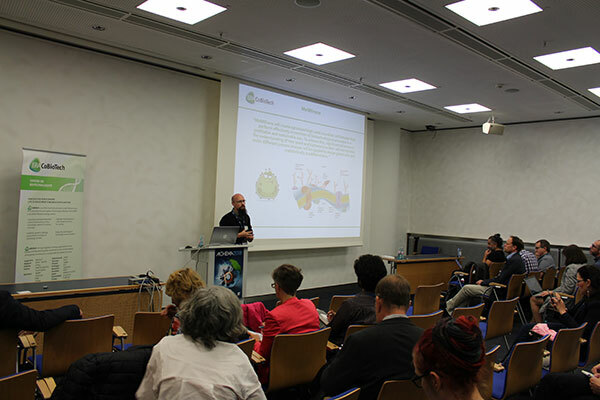 The audience learned about some of the excellent R&D transnational projects combining innovative interdisciplinary approaches, which aim to contribute to the transformation of the global economy from a dependence on fossil raw materials to a sustainable biobased economy. The speakers presented the project teams, which brought together interdisciplinary expertise from both academic and industrial researchers from different countries in Europe and beyond. Over the next three years, the research consortia will work to synthesize new or improve existing cell factories (bacteria, archaea, yeasts, fungi, algae, etc. ), isolate new and improve the performance of existing enzymes (biocatalysts) and enzyme cascades, optimize microbial communities for better performance, upscale industrial processes and so increase their efficiency and economic feasibility, and discover new, efficient and sustainable methods for manufacturing bioproducts. Cell factories (microorganisms) are used to produce platform chemicals from renewable biomass at industrial scale but the current challenge is to design and optimize high-yield strains that can produce commercially viable amounts of product. Prof. Dr. Alan Goddard (Aston University) coordinator of project MeMBrane see as one reason for poor product output the toxicity of the production conditions to the producing cells. An approach to be developed in MeMrane project whereby membranes can be “tuned”, in terms of their lipid and protein content, to become more resistant to stresses brought about by toxicity would revolutionise the field. The project outcomes will contribute to the optimisation of different parts of the value chains of various biobased products such as platform and commodity chemicals (biosurfactants, bioadhesives, solvents, biopolymers and coatings, biofuels), ingredients (flavours, fragrances, etc.) applied in the food and cosmetic industry, agrochemicals, products for personal care and steroids, antibiotics and other bioactive compounds used in human and veterinary medicine. The mission of Prof. Dr. Christoph Wittmann (Saarland University, Germany) and his colleagues from Mission project is to produce new compounds for the medicine and pharmaceutical industry in a sustainable way (avoiding antibiotics resistance), with the help of the two times Nobel Prize winning bacteria Streptomyces. The projects will also focus on open dialogue with the general public and study the social, economic and environmental impact of the planned research activities and the potential commercialization of their achieved results. The talks were followed by very lively discussions with a high level of engagement from the audience. 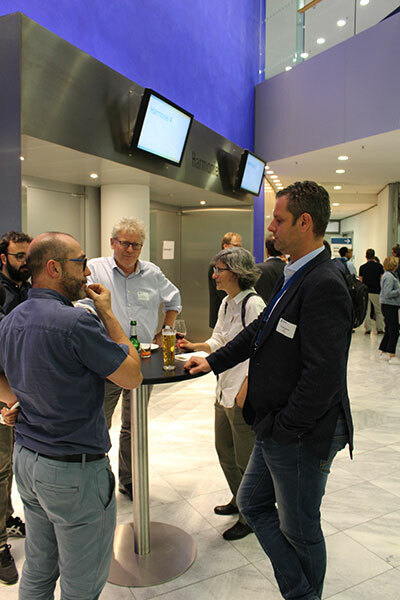 Many early-career researchers (PhD and postdocs) from universities and research institutes near Frankfurt and beyond joined the kick-off event. This is a significant accomplishment, as this shows that newer generations of researchers are successfully being reached, and could be informed about the future activities planned by the ERA CoBioTech. Christian Breuer representing the ERA CoBioTech coordinator - Project management Julich- (right) in a conversation with project coordinators. During the networking reception organized by ERA CoBioTech on 13 June after the kick-off session, the researchers from the ERA CoBioTech funded projects had the opportunity to get to know each other, as well as to discuss their project approaches with ERA CoBioTech funders and interested guests in more detail. This reception was also an opportunity to spark potential new collaborations between academia and industry. The networking reception was supported by BioLinx project. BioLinX powered a dedicated online brokerage platform for ERA CoBioTech, to enable the event registration and post event communication. The brokerage platform, containing the list of attendees, remains active and will be used for partnering and matchmaking during future calls organised by ERA CoBioTech.